Just imagine if you were a French Quarter tourist who’d never heard of Krewe du Vieux, New Orleans’ rudest, crudest Mardi Gras parade. Suddenly a glittering column of marching malcontents — with the cynical world-views of seasoned political cartoonists and the maturity of pubescent boys — came streaming down one of the architecturally precious streets. You’d be aghast at the ordinarily hidden anatomical protuberances, projections and cavities that appeared on many floats and costumes. Your eyebrows would rise at the unflinchingly harsh political criticism and the depiction of romantic eccentricities that would be flagged if they appeared on Facebook. You’d imagine you’d stumbled upon an irredeemably wanton society, like Pompei before the volcano. You couldn’t wait to get home to tell your friends about the outrages you’d witnessed … as you began planning your next visit. Such was the scene Saturday (Feb. 16). New Orleans is the Queen City of the South, and Krewe du Vieux is her jester. Under other circumstances, in other cities, Krewe du Vieux would get its collective head chopped off (figuratively speaking) by the powers that be. But here, it’s just one aspect of the catharsis of Carnival. For the local crowd, Krewe du Vieux was more than just a ribald ramble, it was a catalog of topical concerns. Musician Irvin Mayfield was cast as a reverse Robin Hood for his alleged misuse of New Orleans library funds, the Catholic Church was skewered for its ongoing sexual abuse scandals, the city’s crime cameras were depicted as Orwellian invasions of privacy, the town’s endless infrastructure troubles were trivialized as “Road Twerk,” marijuana was celebrated and (as you might predict) President Trump and the NFL were condemned. 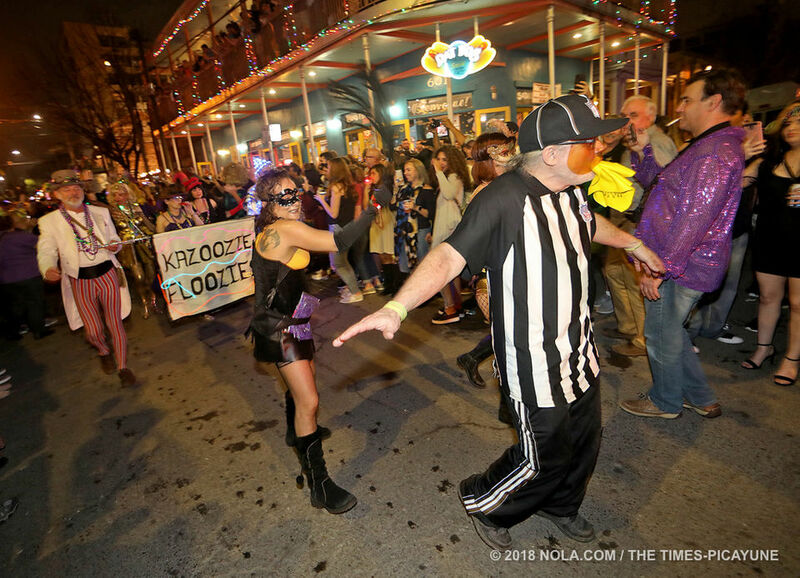 For the past decade, Krewe du Vieux has had a companion parade, krewedelusion, which follows immediately behind on more-or-less the same route. In the beginning, krewedelusion seemed to be the sort-of spacey, artistic, deliberately unfocused kid brother. But things seem to be changing. Over the past few years, krewedelusion has included examples of political/social/ecological consciousness, such as a block-long black tube that protested an oil pipeline and an empty throne that symbolized a perceived lack of national leadership. This year’s krewedelusion theme was “Think Locally, Act Globally.” The parade included The Treme Steppers Social Aid and Pleasure Club that second-lined spectacularly at the head of the procession. It also featured the new Krewe de Mayahuel Mexican-themed marching group for the first time. The parade concluded with a squad of small lighted shopping cart floats that were rolling collection sites for recyclable parade debris. The DIY Carnival groups that popped up post-Katrina are one of the great art and culture stories of the century.